Vagal Tone is the degree to which the vagus nerve can cause the body to relax. "Vagal tone is an internal biological process referring to the activity of the vagus nerve, the tenth cranial nerve located in the medulla oblongata of the brainstem. 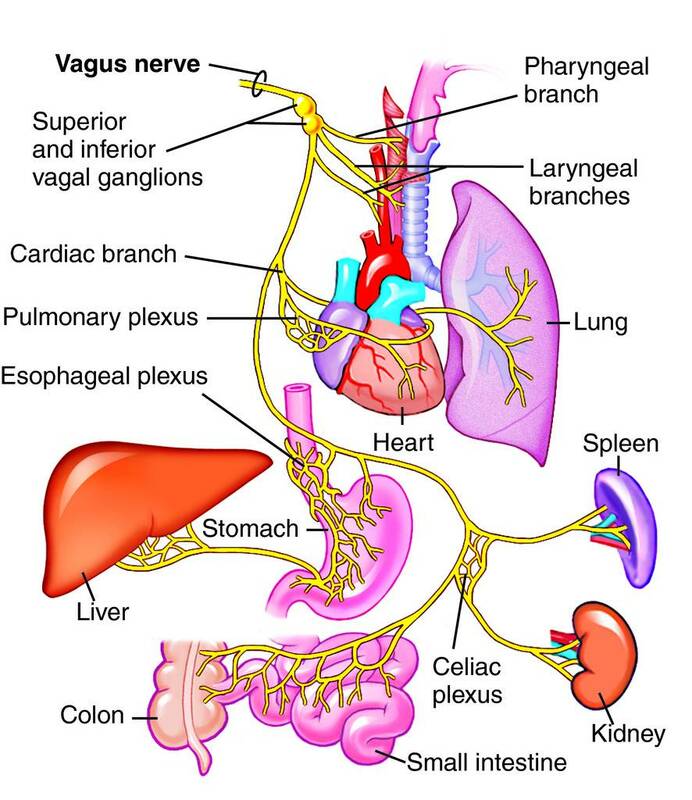 The vagus nerve serves as the key component of the parasympathetic branch of the autonomic nervous system, regulating the homeostasis (or "resting state") of the majority of the body's internal organ systems that operate on a largely subconscious level, such as the heart, lungs, eyes, adrenal glands, and digestive tract." Vagal Tone represents an index for the functional state of the entire parasympathetic nervous system. High Vagal Tone is an indication that the nervous system is able to harmonize the various systems of the body so that they can function together for the benefit of the whole organism. Signals in the vagus nerve cause the relaxation of heart rate, digestion, adrenal output, the gut, salivation, pupillary diameter, etc. This is indicative of a state of calmness, rest or relaxation, in which the body can repair itself. The ability to regulate one's emotions, the ability to feel calm and peaceful, depends on Vagal Tone because it is the vagus nerve that gives the signal to "slow down." One's emotions cannot be calm if one's body is not calm. To experience higher energy and consciousness, the nervous system must be capable of handling the coordinating signals that will be created. Without a healthy, well-functioning nervous system, our spiritual experience is muted. "Cardiac Vagal Tone has been treated as a physiologic substrate of regulation of emotion and arousal." "Respiratory Sinus Arrhythmia (RSA) is a naturally occurring variation in heart rate that occurs during a breathing cycle. RSA is also a measure of parasympathetic nervous system activity - which denotes "rest and digest" behaviors. Vagal Tone cannot be directly measured. Instead, other biological processes are measured that represent the level of Vagal Tone. An increase in Vagal Tone both slows the heart and makes heart rate more variable (i.e. there is more beat-to-beat change between heart beats). Thus, Vagal Tone is indirectly observed by measuring periodic changes in the heart rate during a resting state of cardiovascular activity, a process known as Heart Rate Variability (HRV)." be an HRV of 10, showing good Vagal Tone. An HRV of less than 5 shows poor Vagal Tone. very high vagal tone and HRV levels. HRV also becomes less prominent in individuals with diabetes and cardiovascular disease." Vagal Tone, as measured by HRV, decreases with age but increases with cardio fitness. "In general, young children with a high vagal tone level present more positive psychophysiological, behavioral, and social performance, as well as predictive outcomes in mental, motor, and social skills. Heart rate variability has been linked to a wide array of variables, including: behavioral inhibition, sympathy, instrumental coping, attention, and temperament. A higher vagal tone is typically indicative of more adaptive functioning. By the age of five to six months, vagal tone was found to be positively related to interest and positive expressiveness, while negatively related to repressing stress. This buffering effect continues well into adolescence; studies have found that high vagal tone in eight to twelve years olds buffers against intense verbal marital conflict. It is a very strong effect which has been shown to protect the child against some of the negative effects of parental alcoholism." In Heart Rhythm Meditation, we experience a very strong change in heart rate due to breathing, where the inhalation decreases the heart rate. This is a stronger breath-to-heart-rate effect than what is created unconsciously by RSA. This is documented in our book, Energize Your Heart. Because of this feature, HRM produces a higher Vagal Tone than any other method, including exercise, yoga or other meditation techniques. There is no pharmaceutical that increases Vagal Tone; to the contrary, drugs decrease Vagal Tone.